The complexity of litigation is extremely difficult to communicate simply. Boiling down a case to its core components, key players and critical decisions is paramount to helping arm decision makers with the essential information they need to decide in your favor. Sometimes, it just isn’t possible to condense the material as much as you would like to. In those instances, the goal should be to communicate all of the necessary information as succinctly as possible. In one such matter, we were asked to assist by preparing a timeline to help communicate the entire span of events that took place from the initiation of a patient’s treatment through their preventable and untimely death. The length of the timeline was one concern, but we also had multiple people: the patient, his wife, three separate treatment facilities along with multiple physicians and nurses. Complicating matters further were the descriptions of the actions that took place along the way. Our demonstrative, though seemingly complex, is actually very succinct and it communicates the entirety of the case in one, common demonstrative. The events are color-coded to match the facility. 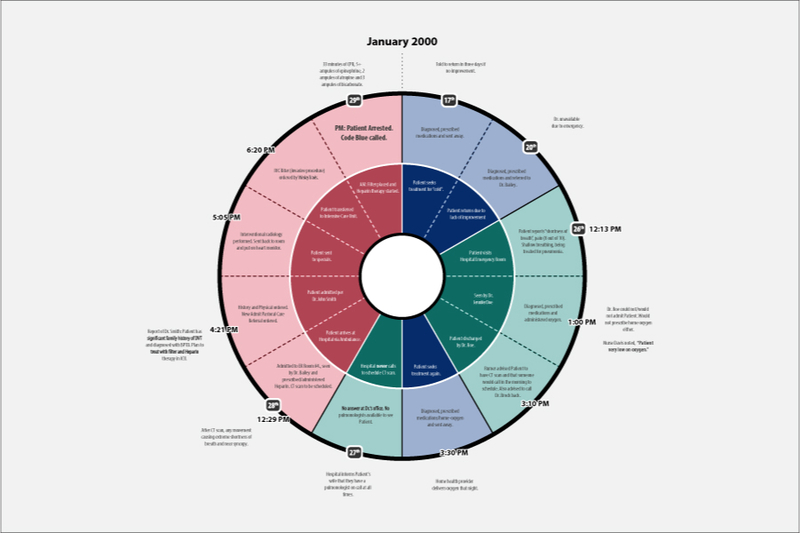 The inner ring denotes the action that the patient – our client – took, the outer ring contains the actions of the respective medical providers and the notes altogether outside of the circle are anecdotes and additional explanations. Along the border of the circle you can also see dates and times that are in reference to the medical records that support our story. It is a lot of information to take in, but our goal was to communicate it in bite-sized chunks so that we could walk through the events on one board as opposed to a long timeline. Every case is different and therefore every demonstrative that we produce varies from the previous because we work to ensure that our ideas are communicated as succinctly as possible to the judge and jury. Give us a call to talk about your case and how we might be able to benefit your presentation of evidence.